The poster has a lot of information, including a timeline of the outbreak and case discovery; analysis of vaccination status, clinical characteristics and lab confirmation of measles cases, broken down by hospitalized and non-hospitalized individuals; comparison of MMR and varicella vaccination rates for 2-year old children born in Minnesota of Somali and non-Somali descent; interventions used; and a discussion of the course of the outbreak. One of the things that first jumped out at me was the timeline. The index case, a 2-year old child who contracted measles during a family trip to Kenya, first developed a rash on February 25. But this was not the first case identified in the outbreak. Nor was it the second or third case. In fact, it was the sixth case identified. Tracing the path of transmission from this child to four other children, and from two of those children to five other children and so on was fascinating. The spread included household contacts of various individuals, childcare centers, emergency departments and two homeless shelters. 14 (61%) were hospitalized (mean 4 days; range 2-7 days). 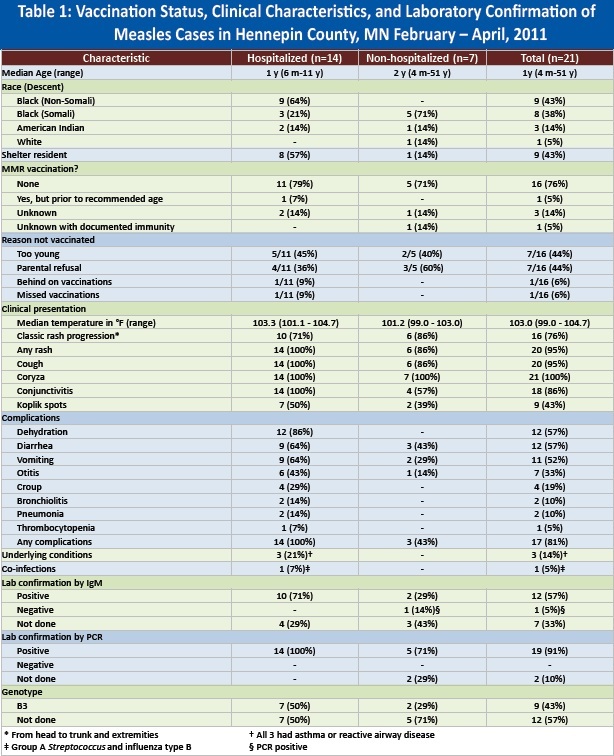 Of the hospitalized cases, 12 (86%) had dehydration, 9 (64%) diarrhea, 8 (57%) vomiting, 7 (50%) otitis, 4 (29%) croup, 2 (14%) pneumonia, 2 (14%) bronchiolitis, and 1 (7%) thrombocytopenia. 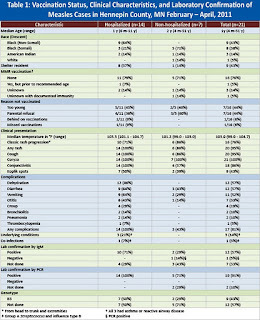 3 (21%) had reactive airway disease or asthma (Table 1). I'm curious to know how many of these complications occurred in the same individuals. For example, did most of the dehydration occur in cases of diarrhea and/or vomiting? Was croup or bronchiolitis connected to pneumonia? Thankfully, though, these individuals did get proper medical care to prevent more serious complications, since some of the reasons for hospitalization could very well have had much worse outcomes, whether it is serious bleeding due to thrombocytopenia or even death by dehydration, given the health care and living status of many of the individuals involved. Many in the anti-vaccine community may downplay these complications as being minor, and that hospitalization was unnecessary. For instance, some might say that diarrhea is nothing serious, yet among infants, and especially among those with poor living conditions, it can be quite serious, potentially fatal. It is important to remember that these hospitalizations were of a severity that simple management was no longer sufficient to keep the patients healthy; more specialized care was required. The sad thing is that these outcomes could have been minimized or prevented altogether through immunization. 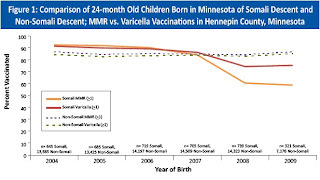 Which brings us to a look at the vaccination rates for MMR among those of Somali descent versus those of non-Somali descent. 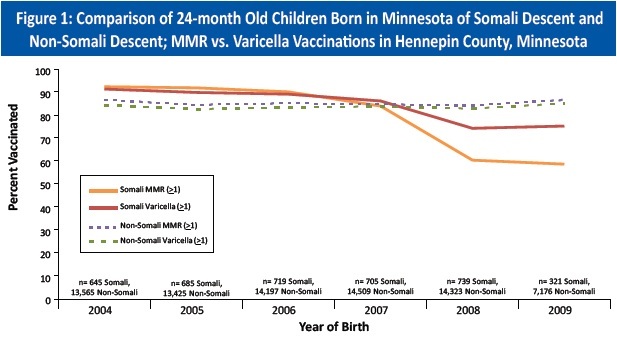 Looking at two-year olds born in Minnesota among these two populations, the average vaccination rates for Somalis were actually higher than for non-Somalis from 2004 to 2007. But something very curious occurred. There was a slight decrease in 2006, with rates among the Somali population becoming about equal with that of non-Somali by 2007, followed by a very steep decline in MMR uptake, going from about 85% in 2007 to just 60% in 2008 and only 57% in 2009. Meanwhile, uptake rates among non-Somalis increased over the same period, approaching 90% for at least one dose of MMR in 2009. Why this decrease among Somalis? What happened during the period from 2004-2007 that may have persuaded Somali parents to stop vaccinating their children with the MMR? My suspicion was that there was some manner of anti-vaccine activism around that time. I looked for mentions of Generation Rescue, but it looks like they were only active after the decline had started, though comments by J.B. Handley certainly did nothing to help stop the drop in immunization rates. The annual Autism One conference had been going on, but that was in Chicago, and it seemed unlikely that many of the parents would have been able to make the trip. My Google-fu failed me. Fortunately, a reader came to my rescue. It seems that David Kirby happened to be touring his book Evidence of Harm in 2005, making a stop in Minneapolis on May 25 of that year. Although his focus was on the erroneous notion that thimerosal caused autism, his message was one that sowed the seed of fear of vaccines. Based on conversations MDH has had with some Somali community members we have found that by the time this issue became public and to the Department of Health’s awareness in 2008, the community was already mobilized. Many of the parents had been attending national DAN autism conferences for several years prior to this time. Word of mouth is a powerful source of communication within the community and as more families had children diagnosed with autism, the community started talking about what to do to prevent this threat. The only information they had prior to a community meeting with them November 2008 was that MMR caused autism. Interspersed with that is that vaccines cause autism. When a parent who had a child with autism tells another parent don’t let your child get the MMR, they listen and many have been refusing MMR since then. So, in the face of what can be a very devastating disorder for their children, the parents were taken in by pseudo-medicine and propaganda. 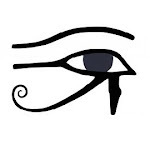 They were lied to by physicians who had no evidence for their claims. Not only were they given false hope that they could avoid autism by avoiding the MMR, their children were left unprotected, and their lives were put at needless risk. One of the only questions remaining to me about this outbreak is the cost. The number crunching remains to be done to find out just how much these 21 cases cost the taxpayers of Minnesota. And what was the cost to the parents, both in terms of providing care for their children and missed wages? The full poster is not currently available online. I do have a copy of the PDF, portions of which are reproduced above (Blogger doesn't allow uploading of PDFs). The good folks at the Minnesota Department of Health were kind enough to send it to me and allow me to share it. If interested in seeing the full poster, send me an e-mail request. Thanks also to Liz Ditz, who helped with some research. Good stuff as always, Todd. I wish I could have been there to see this poster and all the others that are so interesting at the IDSA meetings. This Dehydration posting, completely useful..